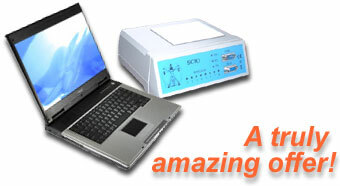 Quantum SCIO Wellness offers a high level of service. The most up to date IAQT Eductor, SCIO,Indigo step-by-step training manual. 6 days Group Training, Basic, Intermediate and Advanced with Certification for Insurance. This may be completed in installments. Individual Training may be arranged. Advice to promote your practice. Skype, Phone and e-mail support. Laptop computer loaded with the latest Eductor64 software. There is an ever evolving IAQT EDUCTOR, Indigo and SCIO step-by-step Training Manual. Structured Training, updates, seminars, service and a world-wide discussion forum. You may have many questions regarding ourTechnology, so please do not hesitate to contact us. We pride ourselves in knowing that we offer full support, and also excellent training, which includes information on how to set yourself up as a Quantum Biofeedback practitioner. Please know that at any time, you can call or email us, to ask questions and learn more. Hard Drive: Minimum of 60GB 5400rpm hard drive. Windows 7 will use up approximately 30 to 35GB or more once you get all of your programs installed. Graphics: Minimum of 512mb Dedicated or Discrete Graphics - on board or integrated graphics are not recommended. Operating System: We are currently recommending Windows 10 and 7. We do not recommend upgrading a computer, although there will soon be limited support available for Windows XP and Vista as Microsoft has discontinued both products. The 32 bit platform is recommended, although in our experience we have not had any problems with the 64bit version. Internet Access: Internet access is required for the Eductor64 software because the software is now updated via an internet update tool. Technical support is now mostly done through remote internet connections to your computer.